I’m Ralph Langer, author of the “Jack Crocker/Jim McGuire” mystery series. 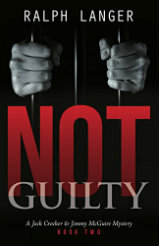 And of “Personal Verdict, a Civil Rights era novel. Jack Crocker and his young, ex-Marine nephew, Jimmy McGuire, are barely recovered from a dramatic warehouse shootout while rescuing Jack’s kidnapped nine-year-old son. A frantic, vengeful father wants the two new private investigators to find the rapists who attacked his young daughter at a campus party. The victim has retreated to house-bound seclusion and depression and the partners struggle to identify the sexual predators and bring them to justice. Simultaneously, the investigators are hired to investigate a death that authorities conclude was a suicide but a prominent black pastor insists was murder. Jack and Jimmy discover an old link between the victim and a recently exonerated convict who was recently released after 33 years in prison for a crime he didn’t commit. When another murder victim has a tie to the long-ago trial, Crocker and McGuire wonder if the freed man is taking revenge on people who railroaded him into three decades behind bars. Jack Crocker's life is disintegrating and his marriage is crumbling after a family tragedy and his losing battle with Post Traumatic Stress Disorder. Crocker, 41, a prize-winning reporter and veteran of both Gulf Wars, is marinating his Iraq nightmares in booze. When he's injured in a bar fight he re-connects with his much younger nephew, Jimmy McGuire, newly discharged from the Marine Special Forces with shocking and unforgettable Afghan war memories of his own. Out of desperation and a lack of other options, they unite to open a store-front Private Investigations agency in a Dallas suburb. 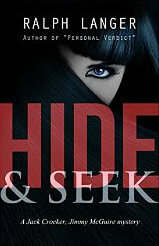 Their cases are mostly routine until a woman hires them to find out who is trying to kill her. She's obviously keeping her own secrets, even from them. Then it appears that she doesn't actually exist. All bets are off when Crocker's family is brutally attacked by professional killers and Jack and Jimmy realize they're trapped in a life or death crisis, possibly with a no-win outcome. College freshman Jeff Martindale's life begins changing almost the instant he meets Rev. Isiah Booker, a former Temple University halfback now active in the nascent Civil Rights Movement. Jeff is from a nearly all-white, small northern Michigan town. Isiah's a Philadelphian, 12 years older and black. Their chance meeting at a casual party on the University of Michigan campus grows from a mutual interest in fly-fishing to full-fledged friendship blended with a mentoring relationship that gradually awakens Jeff to the staggering cruelties of the segregated South, nearly 100 years after the Civil War. Jeff and girlfriend, Susan Adams, volunteer for paper-shuffling duties at the Ann Arbor NAACP, but grow increasingly frustrated with minimal national civil rights progress, even after they're jailed for joining two Tennessee sit-ins. When unspeakable violence strikes, Jeff shockingly risks his life, his future and Susan's love to pursue what only he views as a morally greater cause.